Indexing in MS Excel for Gold Rate Comparison and Trend - Something New Everyday! Indexing, a technique used to compare changes in values over time. 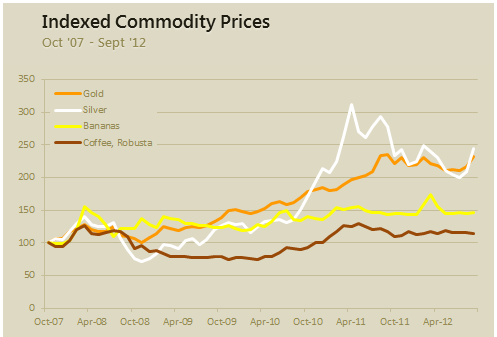 Lets say you want to compare prices of Gold & Coffee over last few years. 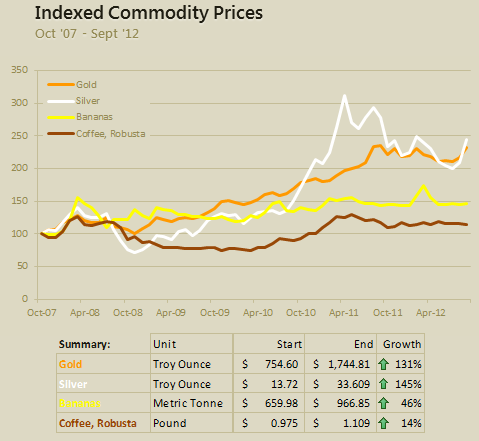 Gold price in 2011 (oct) is $1,655 per ounce. And now (sept 2012) it is $1,744. Like wise, Silver price in 2011 is $32.06 and in 2012 it is $33.61. How do we compare such diverse numbers? First we need to calculate price of Gold and Silver in 2012 assuming their starting price is 100. This can be done with simple arithmetic. Now, we can easily compare the prices. Looking at the indexed prices, we can conclude that both Gold & Silver prices have gone up by similar percentage (~5%). To understand growth (or non growth). Subtract 100 from any indexed value to know how much it has grown (or shrunk) compared to base value. To understand change with respect to a bench mark – ex: performance of a company with respect to stock market index. For more detailed discussion on indexation & its applications, refer to this article by Paresh. 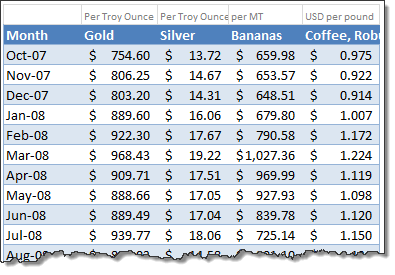 Lets say you are a savvy commodity investor and want to understand how the prices of gold, silver, bananas and coffee have changed since 2007. Now, each of them have a different range of values and comparing all of them in same chart can be very confusing. Let us index the values to 100 and then compare. Step 1: Arrange your data. Step 3: Calculate next indexed value using simple formula. 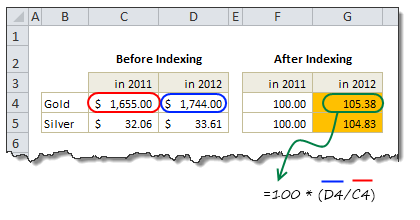 See this illustration to understand how to calculate the indexed values. Select the indexed values and create a line chart. And you are done! This is where you can unleash your creativity. Add labels, legend, format axis etc. Here is a version I came up with.